Firestone Vintage Tires Vintage Radial F560 tires are the world's best selling line of vintage bias tires. Firestone F560 radial tires are a perfect choice for small sports cars. Sizing options allow for many fitments, and this blackwall radial tire is a favorite among Austin Healey, MG, Fiat, Porsche, Volkswagen, Citroen and Renault enthusiasts. Made in original molds to maintain authenticity. Authentic Firestone lettering embossed in the whitewalls where applicable. Backed by Coker's life of the tread warranty. 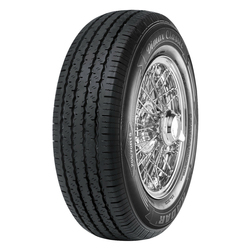 The tread design and compound offer great dry and wet handling, while the tall sidewall and narrow tread profile provide the right look for many vintage sports cars. 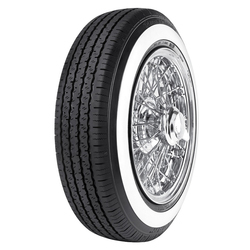 The Firestone F560 is a steel belted radial with P speed rating. All Firestone F560 tires are DOT and ECE approved. Please Note - Tire mounted on wheel for demonstration purposes only. Wheel and other accessories are not included. Radar Tires are made by Omni United, a tire manufacturer and distributing company based in Singapore. Established in 2006, Omni United is committed to making high quality tires at competitive and affordable prices. They pride themselves on being a forward thinking company with a strong commitment to having a positive social, and environmental impact. In addition to achieving certification as carbon neutral in 2013, the Radar brand is a proud supporter of The Breast Cancer Research Foundation© (BCRF). For every Radar tire sold, Omni United donates $5, with a minimum annual donation of $200,000.